NATO jets have been attacking food stores and destroyed a health clinic in Zlitan. The CNN report by Ivan Watson and Jomana Karadsheh from Zlitan, a town half-way between Tripoli and Misrata provides further evidence of how NATO and the rebels are working together closely in a military campaign, not to protect civilians but to conquer anti-rebel areas for the National Transitional Council. Government officials said they were looking for the bodies of three people believed to be buried underneath, and said the bodies of eight people had been pulled out earlier in the day. On Monday morning, an RAF strike mission returned to Zlitan and successfully attacked another military staging post & ammunition stockpile. As the rebels push forward, so loyalist forces and anti-rebel civilians concentrate forces to counter them – presenting targets for the NATO jets. The report from Zlitan indicates the RAF has no great compunction about bombing targets in urban areas (if anyone thought they might have). The fact the civilian population, which came out against the rebels in massive demonstations in Zlitan not long ago, has largely chosen to flee the rebel advance is significant. It is obvious that dark-skinned Libyans and pro-Gaddafi civilians will want to avoid falling under the control of openly racist and murderous rebel brigades. Presuming the rebels do take control of a mainly empty Zlitan (as they have of empty towns in the Nafusa) it will be interesting to see how long for. As their supply lines become extended they are subject to counter-attack, particularly by the inhabitants of the towns they have conquered. As is common with desert warfare, the main aim of the rival militaries is not so much control of territory (which is important for civilians and for propaganda purposes) but destruction of the opposition. In the unlikely event the rebels ever make it to the gates of Tripoli, the destruction which would be meted out to the civilians and defenders of that city can scarcely be imagined. Huamn Rights Investigations condemns this war crime and calls for an immediate end to the bombing of Libya. It is a war crime to attack essential civilian infrastructure. 95% of Libya is desert and 70% of Libyans depend on water which is piped in from the Nubian Sandstone Aquifer System under the southern desert. The water pipe infrastructure is probably the most essential civilian infrastructure in Libya. Key to its continued function, particularly in time of war, is the Brega pipe factory which enables leaks and breaks in the system to be repaired. NATO has admitted that its jets attacked the pipe factory on 22 July, claiming in justification that it was used as a military storage facility and rockets were launched from there. Libyans like to call the Great Man-Made River “The eighth wonder of the world”. 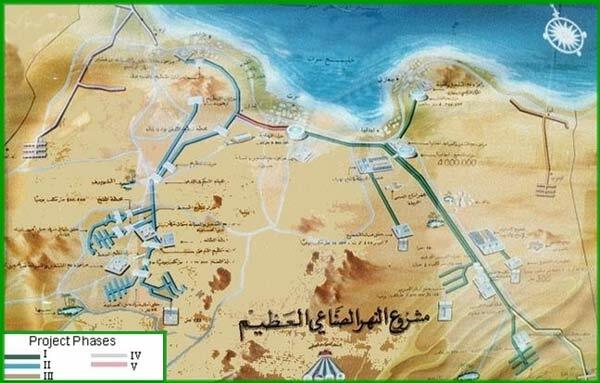 According to a March 2006 report by the BBC the industrialisation of Libya following the Great Al-Fatah Revolution in 1969, put strain on water supplies and coastal aquifers became contaminated with sea water, to such an extent that the water in Benghazi was undrinkable. Finding a supply of fresh, clean water became a government priority and fortunately oil exploration in the 1950s had revealed vast aquifers beneath Libya’s southern desert. On 3 April Libya warned that NATO-led air strikes could cause a “human and environmental disaster” if air strikes damaged the Great Man-Made River project. “If part of the infrastructure is damaged, the whole thing is affected and the massive escape of water could cause a catastrophe,” leaving 4.5 million thirsty Libyans deprived of drinking water. The Pre-Stressed Concrete Cylinder Pipe Factory at Brega is one of only two such facilities in Libya – the other being at Sarir to the east. This makes it a very important component of the Great Man-Made River – with two production lines making up to 80 pipes a day. As a result, Libya is now a world leader in hydrological engineering and it wants to export its expertise to other African and Middle-Eastern countries facing similar problems with their water. Approximately 500,000 pre-stressed concrete cylinder pipes have been manufactured to date. Approximately 500,000 pipes transported to date. Pipe transportation is continuous process and the work goes on day and night, distance traveled by the transporters is equivalent to the sun and back. Over 3,700 km of haul roads was constructed alongside the pipe line trench to enable the heavy truck – trailers to deliver pipe to the installation site. On Monday 18 July rebel spokesman Shamsiddin Abdulmolah told AFP that remnants of Gadhafi’s troops were holed up among industrial facilities in Brega with supplies dwindling. Given the rebel boasts that the pro-Gadaffi forces in Brega had no water, the question has to be posed whether this attack was a deliberate attempt to prevent repair of the pipeline into Brega. The building you hit (apparently in the Brega pipe factory) was being used for what kind of military storage? What considerations were taken into account to ensure that the strikes did not damage civilian infrastructure or was damage to the civilian infrastructure considered legitimate? Given the potential consequences to civilians of damage to the pipe factory and the ability of the engineers to be able to repair broken water pipelines I hope you will appreciate the importance of these questions. Now in the area of Brega, NATO strikes included armoured vehicles, rocket launchers, military storage facilities and a repurposed concrete factory from which Pro-Gaddafi forces were using multi-viral [sic] rocket launchers, exposing the population to indirect fire. 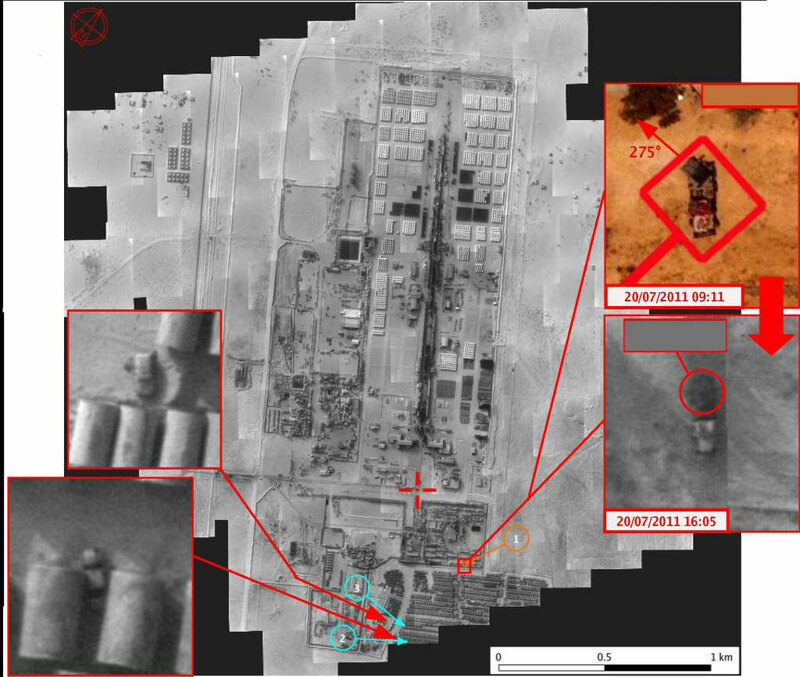 So basically repeatedly over the last few weeks we got clear intelligence indicating that pro-Gadaffi forces are using this factory for military purposes. This factory is being used to hide military material including Multiple Rocket Launchers. These weapons have been used every day from within this factory compound and then carefully hidden after the day within or along massive pipes you can see in this picture. Slide 1 20 July apparently shows a BM-21 rocket launcher -a model of rocket launcher widely used by both loyalist and rebel forces in Libya. Slide 2 23 July apparently shows a BM-21 rocket launcher. 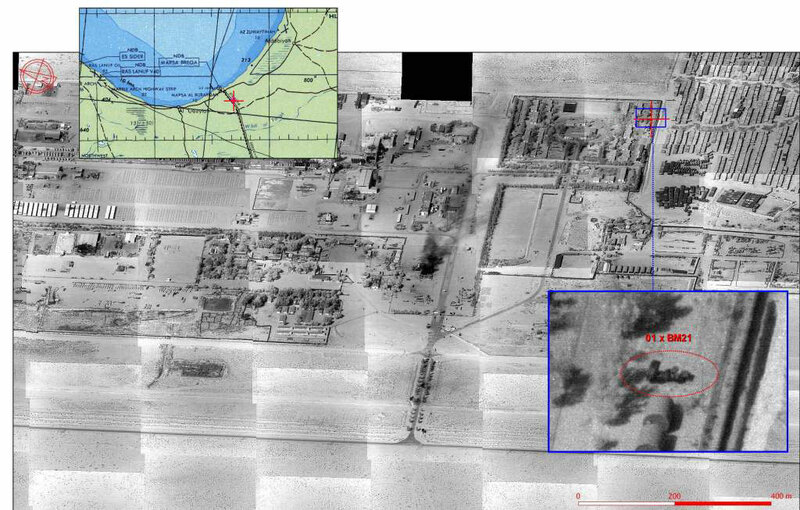 The slide shows black smoke in the centre of the picture which suggests two hits (possibly on vehicles) have already been made, with the BM-21 left intact. Neither slide appears to show the building which was destroyed in the video or helps to understand when or why that was hit. So the photos lead to more questions than they answer – clearly the BM-21, spotted on the 20th, was not considered a priority target, and there is nothing in the NATO explanation which explains why the water supplies of the Libyan people have now been put at such risk. 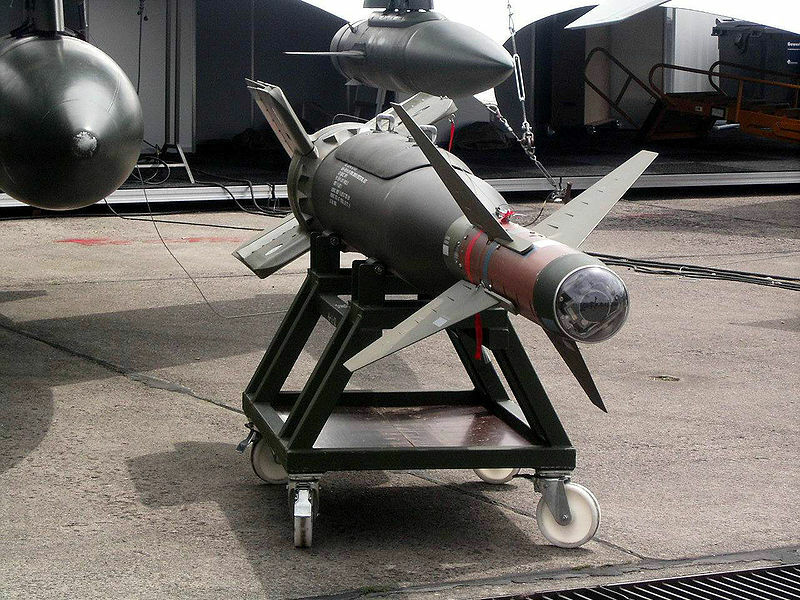 The factory is being used to hide military material, including multiple rocket launchers. These weapons have been used every day from within this factory compound and then carefully hidden after the day within the factory buildings and the area. All sites that could be used by the pro-Qadhafi regime forces to threaten or attack civilians can be considered as a legitimate target by NATO in full accordance with UNSCR 1973. That resolution mandates the use of all necessary measures to protect civilians in Libya from attack or threat of attacks. According to the NATO press office, the attack was within the rules of engagement agreed upon by all 28 countries in the coalition by consensus. It seems unlikely that the rules of engagement would allow this attack or that the states in the Security Council would agree that a devious interpretation of UN Security Council Resolution 1973 should supercede international humanitarian law. Do you have any concrete evidence that rockets were fired from inside the pipe-making plant? Can you explain the precise targeting and timing of strikes within this facility? What steps were taken to ensure collateral damage to the facility was avoided? What alternatives were considered to military strikes on this factory? The Laws of War were designed to prevent attacks on targets indispensible to the civilian population, so attacking a civilian infrastructure target such as this plant is a war crime. Even if rockets were being fired from within the location (for which no evidence has been produced) or this facility was being used for military storage by Gadaffi forces, or housed armoured vehicles, attacking the pipe-making factory in a way that leaves it severely damaged is illegal as this facility is important to the water supplies of Libyan civilians. The citing of UNSCR 1973 does not supercede the need for NATO forces to obey the laws of war. Rule 54. Attacking, destroying, removing or rendering useless objects indispensable to the survival of the civilian population is prohibited. 2) A peace congress be convened to bring this conflict to a rapid end. 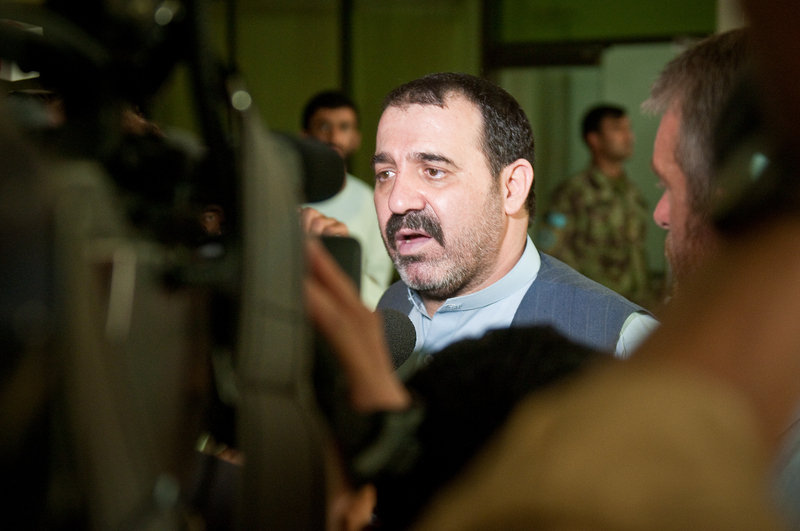 Ahmed Wali Karzai, the second biggest heroin dealer in the world and NATO’s top man in Kandahar (as reported by Craig Murray ) has been killed by his head of security, Sardar Mohammed, in an operation claimed by the Taliban. It says a lot about NATO ‘policy’ in Afghanistan that the death of this warlord is a major blow to their campaign. 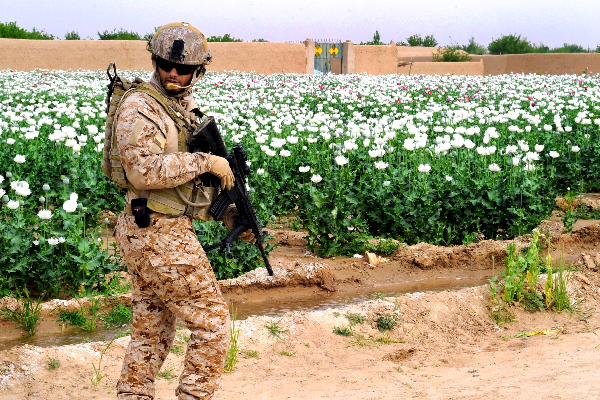 Ahmed Wali Karzai was a kingpin in the Afghan heroin trade, which has been a massively profitable enterprise for those involved – although little of the money is seen in Afghanistan, let alone by the farmers. So the $1 billion a year smuggled out of Afghanistan to Dubai, and reported by the Washington Post, represents just the tip of the iceberg. Whilst we are pondering NATO’s mission to “protect civilians” by preparing the way for ethnic cleansing in Libya, it is worth remembering the lessons of Afghanistan and we highly recommend our readers to watch Carmela Baranowskas’ brilliant “Taliban Country,” which points to some of the inherent contradictions in that campaign. The film shows local villagers, forced to flee the country or join the resistance as the US forces ally themselves with rival tribal militia commanders. It also shows a “head of civil affairs” who, despite the billions poured into the country, is unable to muster the resources to save a dying Afghan child, brought to him by a local villager and in need of basic vitamins. Here is the film – its long but well worth watching. NATO has disclosed some ways they use twitter according to a report released by AFP. NATO has made three statements regarding their use of Twitter. Firstly Wing Commander Mike Bracken has stated that NATO gets information from “open sources on the internet, we get Twitter,” which is a surprise to no one. A) These activities run the risk of blurring the distinction between combatants and the civilian population which can endanger the general civilian population. B) Regarding 1) – it isn’t stated whether these Libyans are combatants (integrated in the militia) or civilian, but its worth noting that civilians who engage directly in combat – which would include providing targeting information – would run a risk of being placed in the unfortunate category of “unlawful combatants” and facing criminal liability for their actions. Just to note, even if they were placed in this category, they should still be treated humanely but they might not be granted POW status. C) States using civilians in violation of the law of war will be in breach of their responsibility under that law. In a conflict ostensibly aimed at protecting civilians, which will doubtless inform the way future conflicts are conducted, consideration needs to be given to these issues.